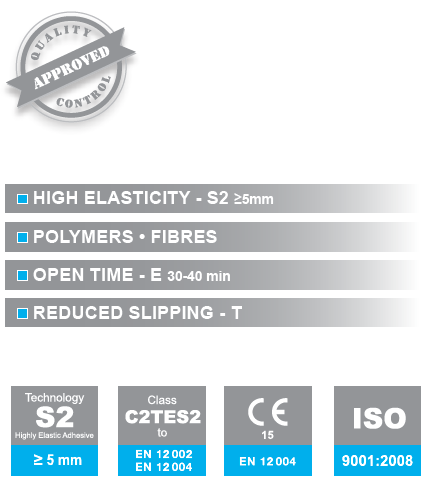 HIGHLY FLEXIBLE CEMENTITIOUS TILE ADHESIVE WITH FIBRES, CLASS C2TES2 In compliance with the requirements of Standard EN 12004 and EN 12002. Portland cement, fractionated quartz sand, polymer additives, fibers. Adhesive with high elasticity after hardening for adhesion of ceramic tiles, granitogres, and glass mosaics. It ensures flexible adhesive layer which absorbs the inner tension in the deformable and critical substrates and prevents the tiles from coming off. It is suitable for laying on preliminary prepared substrates of drywall and wooden materials, and for the tiling of swimming pools with glass tiles in a combination with water insulation materials. For tiling of heavy duty facades and places. 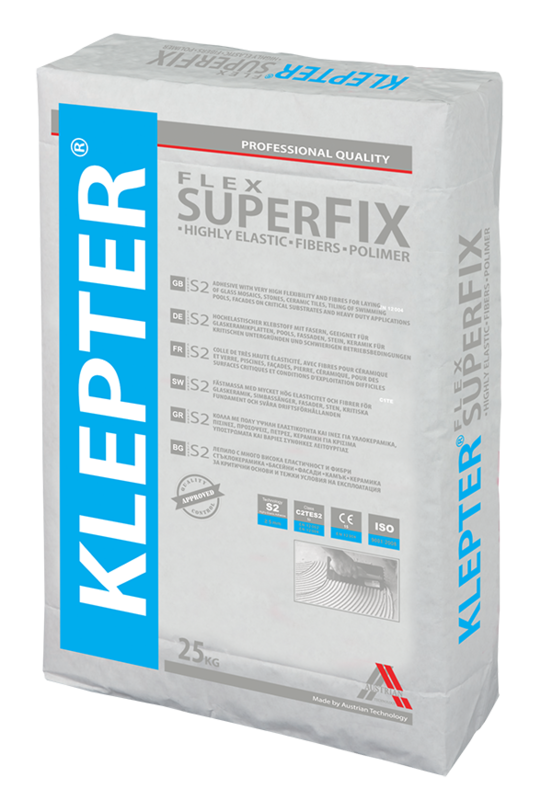 Super flexible – class S2, excellent for tiling of swimming pools and facades; decreased slipping when laid on vertical substrates, water- and freeze resistant. The substrate must be clean, dry and sound, without cracks. Primer must be applied beforehand on highly absorbent surfaces. Mix a bag of 25 kg of adhesive with 5.5 L of water. In a suitable container add the dry mix to the required quantity of water and mix with a mixing device until a homogeneous consistency is attained. Leave the mixture to stay for 10 min., then mix again and the product is ready to use. Important – re-stirring the mixture increases the strength indices of the product. Apply the adhesive with a square notch trowel with notch size from 4 x 4 mm to 8 x 8 mm depending on the size of the tile. First apply a thin contact layer on the substrate and then using the notched side of the trowel, comb out the still fresh adhesive. Lay and press the tiles in the fresh adhesive. To align the tiles use plastic cross spacers with the necessary dimension. When laying non-porous tiles, tiles with large sizes, or laying tile on tile, apply adhesive on the substrate and on the back of the tile – this will guarantee maximum adhesion between the tile and the adhesive. Addition of other materials in the ready mixture is not allowed. The recommended temperature range of use is from +5°C to + 35°C. From 2 kg/m2 to 5 kg/m2 depending on the size of the notches of the square trowel and how even the surface is. To be kept in a dry and well ventilated place.